Do Breast Cancer Survivors Respond Differently in the Heat Compared to Healthy Females? 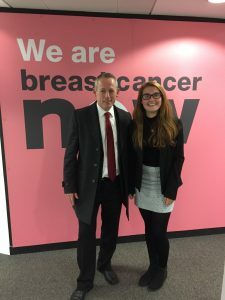 Rebecca Relf, a Technical Instructor and PhD Student within our Environmental Extremes Lab is investigating the ‘physiological differences in females that have been diagnosed and treated for breast cancer compared to those females who have not’. Why Study Cancer & Environmental Extremes? Cancer is one of the leading causes of mortality in the UK and worldwide, with approximately 2 million individuals living with cancer in the UK, and 1 in 8 females facing a diagnosis of breast cancer in their lifetime (Eisemann et al, 2013). With increasing advancements in technology and treatment, the survival rate is currently 78% in the UK and rising (Cancer Research UK, 2017). So What is the Problem with Breast Cancer Survivor ‘s Thermoregulation? These side effects, especially the most commonly reported hot flashes and night sweats, indicates the potential of some form of thermoregulatory dysfunction. Figure 1 below highlights how a hot flash occurs with a reduced thermoneutral zone and thresholds. Figure 1. highlighting the differences in thresholds between those symptomatic (suffering hot flashes) and those asymptomatic (no hot flashes). Where Tc = core temperature and HF = hot flash. (Archer et al., 2011). How Can We Help Breast Cancer Survivors during Heatwaves? With the heatwave that the UK is currently experiencing, it is important to stay safe in the heat, being safe with your exercise, think about ways to lessen the heat stress (indoors and outdoors), using a variety of cooling strategies, especially before going to bed to give you a better night sleep. 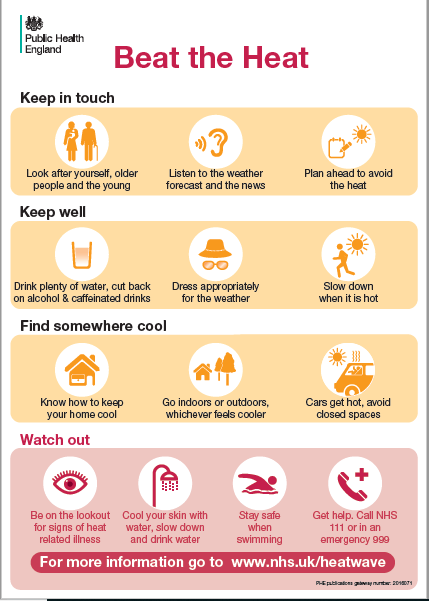 Great websites for top tips in how to stay safe in the heat can be found on the NHS website and Public Health England’s Beat the Heat brochure (Figure 2). Archer, D. F., Sturdee, D. W., Baber, R., de Villiers, T. J., Pines, A., Freedman, R. R., Gompel, A., Hickey, M., Hunter, M. S., Lobo, R. A., Lumsden, M. A., MacLennan, A. H., Maki, P., Palacios, S., Shah, D., Villaseca, P. & Warren, M. (2011). Menopausal Hot Flushes and Night Sweats: Where Are We Now? Climacteric. 14 (5), 515-528. Cancer Research UK (2016) ‘Breast Cancer Incidence (Invasive) Statistics’, [available online], accessed: [June, 2017]. Eisemann, N., Waldmann, A. & Katalinic, A. (2013). Epidemiology of Breast Cancer – Current Figures and Trends. Geburtshilfe Frauenheilkd. 73 (2), 130-135. This entry was posted in Health, Heat, PhD Student News, Research, Safety by Neil Maxwell. Bookmark the permalink.